West African drum beats emanated from the room as hundreds of parents and children watched, captivated by the intricate rhythms. Led by master drummer Bolokada Conde, around 20 drummers played together to create a sound unique to traditional African music. But unlike Conde, these drummers did not hail from West Africa. They were elementary students from the Champaign-Urbana area. One drummer, Joanie Urban, 9, comes from a musical family. She said the West African drumming is a different type of music than she is used to, but she enjoys the change. "I like to play instruments that I don't usually get to play," Urban said. Urban and the other performers are part of the drum circle class through the After School Arts Program (ASAP), a program developed in the fall semester of 2008 by the College of Education's Center for Education in Small Urban Communities. The purpose is to collaborate with local schools, offering high quality education in the arts to underserved middle and elementary school students after school and free of cost, said program coordinator, Sonia Warfel. "It really expands students' ideas of what dance can be and of what art can be," Warfel said. Providing these programs for students at no cost is also important because of recent cuts to the arts within schools, Warfel said, and therefore partnering with local schools can supplement and enrich the curriculum schools already have in place. "So many programs like this come and go, but we are genuinely invested in this partnership," Warfel said. "It's a really mutually beneficial relationship in the sense that the students within the schools are exposed to experiences they may not otherwise have, but also the University student teachers that I place are having a really valuable life experience." In addition to the West African drumming class offered to South Side Elementary students, the program provides dance and visual art classes to students at Franklin Middle School. Warfel said eventually the program would like to expand to provide classes for other local schools. "We have had requests from other school districts to introduce programs like ASAP because they've completely eliminated their arts programs," said Lisa Monda-Amaya, Director of Research Collaboration at the Center for Education in Small Urban Communities. Within each unit, students receive weekly instruction. During the semester they also attend a field trip to work with artists in the community, and finally, they participate in a culminating event to showcase what they have learned. 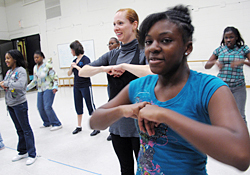 For several Franklin Middle School students, their field trip took them to the Krannert Center for the Performing Arts to learn about the connections between tap dance, hip-hop dance and step dance. The dance team and step team from Franklin met up with University dance majors performing in tap and the Hip Hop Project to exchange moves and learn from one another. "It was just really, really fun," Warfel said. "We talked about the connection between rhythm dance and the trans-Atlantic slave trade and how these art forms evolved from a historical perspective." The culminating performances and exhibitions, such as the drum circle event for parents and community members, are designed to illustrate the enrichment students such as Joanie Urban can gain from the After School Arts Program. "Just the fact that it gives her exposure to all different instruments is fabulous," said Urban's mother, Anna Kasten. "It's a hands-on opportunity to know right here in Champaign-Urbana that there's a whole different world out there."